FASCISM/NAZISM HIDING BEHIND RED STAR(MAKE NO MISTAKE ABOUT THAT - ONLY QUESTION IS WHO IS NEXT BECAUSE WEST WHICH NEEDS AGGRESSIVE RUSSIA WILL NOT STOP OR REACT TO WHAT YOU SEE HERE) !!! (Moscow) – Law enforcement authorities across Russia have carried out a sweeping campaign against Jehovah’s Witnesses in recent months, Human Rights Watch said today. The authorities have carried out dozens of home searches, raids, interrogations, and other acts of harassment and persecution. The authorities are holding 18 men in pretrial detention on charges of organizing, participating in, or financing the activities of an “extremist organization” solely for their religious activities. Several others are facing the same charges and are under house arrest or subject to travel restrictions. The charges carry a maximum 10-year prison sentence. Russian authorities should release those in detention immediately, drop the charges, and halt the persecution of Jehovah’s Witnesses. Human Rights Watch interviewed four lawyers defending Jehovah’s Witnesses in five regions and a representative of the Jehovah’s Witnesses. Human Rights Watch also reviewed court documents, media reports, Russian government statements, and Federal Security Service (FSB) photos and videos purporting to show the raids. 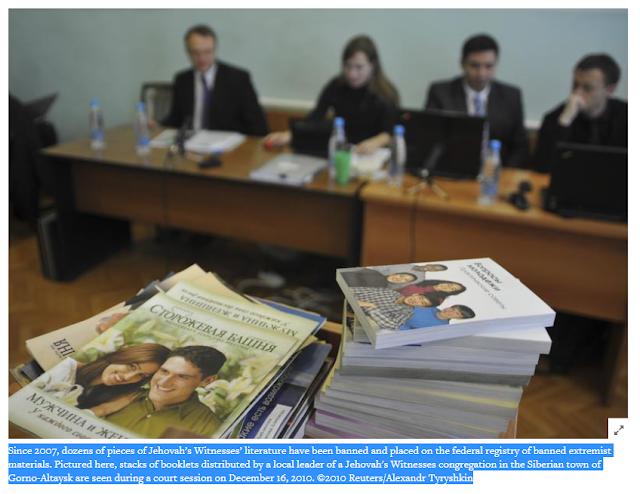 The raids and arrests stem from an April 2017 Russian Supreme Court ruling that banned all Jehovah’s Witnesses organizations throughout Russia. The ruling declared the Jehovah’s Witnesses Administrative Center, the head office for 395 Jehovah’s Witnesses branches throughout Russia, an extremist organization and ruled that all 395 be shut down. The ruling, which affects more than 100,000 Jehovah’s Witnesses across Russia, blatantly violates Russia’s obligations to respect and protect religious freedom and freedom of association. Russian authorities should reverse the ban on the organization’s activities and remove the “extremist” designation, Human Rights Watch said. Meanwhile, they should leave Jehovah’s Witnesses free to practice their faith. Jehovah’s Witnesses in Russia and other former USSR countries have faced persecution in the past. During the Soviet era, they were arrested and imprisoned in labor camps, including in Siberia. Within the past decade, worshipers across Russia have faced persecution, intrusive home searches, and arrests, and have been denied rights to freedom of assembly, association, and religion. In 2010, the European Court of Human Rights ruled against Russia for closing the Moscow branch of the Jehovah’s Witnesses and refusing to allow the group to re-register. The court found violations of articles 9 and 11 of the European Convention on Human Rights, which protect freedom of religion and association, respectively. In addition to awarding monetary damages, the court said that Russia should review the domestic decisions that led to the violations. Russia has refused to carry out the judgments in that case and several others brought by members of the Jehovah’s Witnesses. On the contrary, Russia has continued to persecute Jehovah’s Witnesses, seeking the group’s complete dissolution in Russia. From April to June 2018, law enforcement raids targeted Jehovah’s Witness communities in at least 11 regions throughout Russia, from Saratov region in southwestern Russia to Primorsky Krai in Russia’s far east. Police carried out the raids, often accompanied by a combination of FSB officials wearing masks, armed personnel of the Interior Ministry Special Task Police Force or National Guard, and representatives from the Investigative Committee, Russia’s criminal investigation service. The authorities, who obtained search warrants or entry permits in most cases, confiscated personal computers, mobile phones, bank cards, passports, religious literature, and, in some cases, housing deeds. Dozens of Jehovah’s Witnesses, including at least one child, were taken to local investigative offices for questioning. Others were detained and later charged. A lawyer representing a Jehovah’s Witness who is in pretrial detention in Murmansk Region told Human Rights Watch that the authorities’ actions contradict religious freedom guarantees in the Russian Constitution. “The [Russian] constitution says that you can practice your faith together with others, but as it turns out, that’s a crime,” said Yegiazar Chernikov, of the Sverdlovsk Lawyers’ Association. In at least two regions, armed officers threatened the worshipers with firearms, in one case pointing a gun at a person’s head, a lawyer familiar with the incident told Human Rights Watch. A Jehovah’s Witnesses representative told Human Rights Watch that approximately 160 Jehovah’s Witnesses have fled Russia to seek refuge abroad. On June 20, Russia’s Presidential Council for Civil Society and Human Rights announced that it had asked the prosecutor general’s office to verify the legality of criminal prosecutions against Jehovah’s Witnesses practicing their faith. A week earlier, several of the spouses of the men in pretrial detention had sent a letter to the chair of the council, Mikhail Fedotov, urging him to ask President Vladimir Putin to end the raids and arrests and to restore freedom of religion in Russia. Over 150 Russian activists, journalists, and academics – including several members of Memorial, Russia’s foremost human rights group – signed and published an open letter urging the authorities to immediately release those in detention and to reverse the Supreme Court’s decision to liquidate the Jehovah’s Witnesses’ organization. Jehovah’s Witnesses in Russia – like all people in Russia – should be able to peacefully exercise their rights to freedom of religion and association, Human Rights Watch said. Freedom of religion is guaranteed by the Russian Constitution as well as the European Convention on Human Rights and the International Covenant on Civil and Political Rights, to which Russia is a party. The Jehovah’s Witnesses are a peaceful religious community. The consistent show of force in raids in many locations in Russia was disproportionate and seemed aimed at sending a strong message of intimidation, Human Rights Watch said. On May 17 in Birobidzhan, in southeast Russia, representatives of the Jehovah’s Witnesses reported that about 150 law enforcement personnel raided the homes of at least nine Jehovah’s Witnesses, confiscating photos, bank cards, money, and computers. An official reportedly said that the operation was code-named “Judgment Day.” One person was arrested and charged with organizing activities of an “extremist organization” but was released from pretrial detention eight days later. On April 18 in the town of Polyarny in the Murmansk Region, in northwest Russia, armed law enforcement agents raided at least seven homes and arrested two men. They took several others into custody for questioning and later released them. Police also took a 16-year-old girl into custody and questioned her at the local investigative unit for several hours. A video posted on the Murmansk Investigative Committee’s website shows men wearing camouflage uniforms and helmets forcing open a door to an apartment. The arrest and raid campaign took place as the trial of a Jehovah’s Witness who is a Danish citizen, Dennis Christensen, continues in Orel, a city in western Russia. Christensen, who was arrested in May 2017, is being tried on charges of organizing activities of an “extremist organization” and faces a maximum 10-year prison sentence if convicted. He has filed a complaint with the European Court of Human Rights alleging, among other things, that his arrest constituted unlawful interference with his right to freedom of religion. A lawyer who is defending three Jehovah’s Witnesses in two regions said that throughout the past eight months, FSB agents in the Orenburg Region and the Republic of Bashkortostan conducted wiretapping, videotaping, and other surveillance of Jehovah’s Witnesses’ activities – for which they said they had warrants – as part of the investigation. In some cases, the lawyer said, authorities placed recording devices in Jehovah’s Witnesses’ homes. Earlier in 2018, police raided more than two dozen Jehovah’s Witnesses’ homes in Belgorod and Kemerovo. Two Jehovah’s Witnesses in Belgorod are facing extremism charges. On June 12, authorities in Saratov Region, southwestern Russia, raided at least seven homes of Jehovah’s Witnesses in the city of Saratov and village of Shirokoe. According to the Jehovah’s Witnesses in Russia, special forces officers broke down doors and confiscated computers, books, notebooks, photographs, bankbooks, and passports. The authorities took at least 10 people to FSB offices for questioning. Three were detained and charged with organizing activities of an “extremist organization.” They are: 43-year-old Konstantin Bazhenov, 35-year-old Aleksei Budenchuk, and 33-year-old Felix Makhammadiyev. On June 14, the Frunzensky District Court placed all three in pretrial detention until August 12. Law enforcement raided several homes and cars belonging to Jehovah’s Witnesses in Tomsk between 10 a.m. on June 3 and about 2 a.m. the next day, the Jehovah’s Witnesses in Russia reported. Officers confiscated Bibles, mobile phones, tablets, computers, photographs, money, bank cards, and other personal possessions. They took about 30 people to the police anti-extremism center for questioning. According to a statement by the Tomsk Investigative Committee, the searches were part of a joint FSB and Internal Affairs Ministry investigation into meetings of Jehovah’s Witness residents in Tomsk. Investigative authorities allege that worshipers studied prohibited, “extremist” religious materials and carried out organized religious activities in violation of the Supreme Court’s ruling against the Jehovah’s Witnesses Administrative Center. Representatives of the Jehovah’s Witnesses told Human Rights Watch that 48-year-old Sergei Klimov was detained after a search of his home on June 3, was charged with organizing activities of an “extremist organization,” and will remain in pretrial detention until August 4. Russian officials have verified that criminal cases against Jehovah’s Witnesses have been opened in Magadan, in northeast Russia. The Jehovah’s Witnesses in Russia reported that on May 30, FSB and law enforcement officers arrested Konstantin Petrov, 31; Yevgeny Zyablov, 41; Ivan Puyda, 40; and Sergei Yerkin, 66, after searching their homes in the city of Magadan. All four are accused of organizing activities of an “extremist organization” and will remain in pretrial detention until July 29. Investigators arrested Ilham Karimov, 37; Vladimir Myakushin, 30; Konstantin Matrashov, 25; Aydar Yulmetyev, 24, on suspicion of organizing and participating in the activities of an “extremist organization” and placed them in pretrial detention until July 25. The Naberezhnye Chelny City Court displays records of all four hearings. According to the religious freedom monitoring group Forum 18, Karimov, Myakushin, and Matrashov have appealed their pretrial detention. The Jehovah’s Witnesses in Russia reported that on the evening of May 22, Aleksandr Solovyev, 48, and his wife, Anna, were detained at the railway station in Perm, in the Ural Mountains region, after returning from a trip abroad. Law enforcement then searched the couple’s home and reportedly seized property deeds, photographs, several Bibles, and a Wi-Fi router. Before the 2017 Supreme Court ruling banning the Jehovah’s Witnesses Administrative Center, Solovyov chaired the Perm Jehovah’s Witnesses congregation, according to the Jehovah’s Witnesses in Russia website. On May 18, 55-year-old Alam Aliev was placed in pretrial detention until July 13 under suspicion of organizing activities of an “extremist organization.” The FSB stated that its request to detain Aliev “was motivated by the fact that the crime is classified as grave” and because “[t]he suspect may impede the criminal proceedings, put pressure on witnesses, and also evade investigative and judicial authorities.” Following an appeal by Aliev’s lawyer, Aliev was released from detention on May 25 but still faces charges. On May 16 in Orenburg Region, Investigative Committee authorities, FSB officials, and armed National Guard officers searched 18 homes in four cities. Vitaly Svintsov, a lawyer representing two Jehovah’s Witnesses in the region, told Human Rights Watch that nine people were charged with organizing or participating in the activities of an “extremist organization.” Two of them, Aleksandr Suvorov and Vladimir Kochnev, both 38, remain in pretrial custody until July 14. Twenty-six-year-old Vladislav Kolbanov remains under house arrest. The other six remain under travel restrictions while the investigation is ongoing, Svintsov said. Photographs of some of the raids posted on the Orenburg Investigative Committee website show FSB officials and riot police in bulletproof vests and masks approaching Jehovah’s Witnesses’ residences. Forum 18 reported that law enforcement raided four homes in the town of Shuya, western Russia, early on the morning of April 20. Several homes belonging to Jehovah’s Witnesses were reportedly raided on April 19 in the far-east city of Vladivostok. Human Rights Watch was able to confirm that on April 23 Valentin Osadchuk, 42, was placed under arrest by Frunzensky District Court on charges of participation in the activities of an “extremist organization” after authorities searched his home and confiscated computers, notebooks, and other devices. He remains in pretrial detention until September 20. Representatives of the Jehovah’s Witnesses told Human Rights Watch that five others face the same charges but remain at liberty subject to travel restrictions. On the evening of April 18 in the town of Polyarny in the Murmansk region, armed law enforcement raided at least seven homes and arrested two Jehovah’s Witnesses, Roman Markin, 44, and Viktor Tifimov, 61. Others whose homes were searched were taken to the local investigative unit for questioning and later released without charge. Markin’s lawyer, Arli Chimirov, told Human Rights Watch that armed officers broke down Markin’s door and told him and his 16-year-old daughter, who was at home with him, to lie on the floor while law enforcement threatened them with firearms and searched the apartment. Markin’s daughter was escorted to the investigative unit and was questioned for several hours along with her mother, who arrived some time later. On April 23, 2018, the Polyarny District Court placed Markin in pretrial custody until June 11. Markin’s lawyer unsuccessfully appealed the decision. According to court documents on file with Human Rights Watch, investigative authorities requested that Markin be placed in pretrial detention because of the risk that he “may continue criminal activities, threaten participants in the legal proceedings, hide or destroy evidence, and also fail to attend preliminary court hearings.” On June 4, Markin’s pretrial detention was extended to October 11. Tifimov’s lawyer, Yegiazar Chernikov, told Human Rights Watch that beginning in October 2017, investigators had been collecting as evidence audio and video recordings of conversations among Jehovah’s Witnesses. Chernikov said that on several occasions, a woman involved in the investigation invited Tifimov to her home, where audio and video recording devices were in place, and asked him questions given to her by investigative authorities and designed to incriminate him. The religious freedom group Forum 18 reported that approximately 60 law enforcement officers, some of them armed, raided eight homes in the city of Ufa, south-central Russia, on the morning of April 10. Investigators confiscated personal belongings, books, and photographs. The lawyer representing one of the Jehovah’s Witnesses who was detained said that authorities threatened worshipers with weapons, in one case holding an automatic weapon to a person’s head. On April 12, Anatoly Vilikevich, 32, was arrested on suspicion of organizing activities of an “extremist organization,” and placed in pretrial detention. Vilikevich’s lawyer, Vitaly Svintsov, who appealed the order, told Human Rights Watch that on June 21 the Supreme Court of Bashkortostan overturned the lower court’s decision and placed him under house arrest. A statement by the Bashkortostan Republic Investigative Committee alleged that Vilikevich had organized a local chapter of the banned Jehovah’s Witnesses Administrative Center. Investigators who searched his home confiscated “prohibited literature,” the statement said.